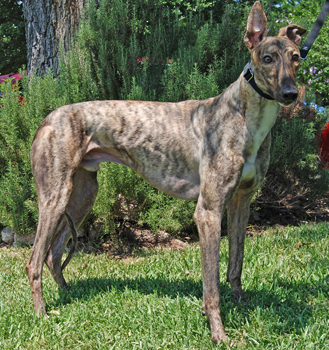 Lynn, aka Cousin Lynn, is a 2-year-old brindle male born July 1, 2009. His sire is Lonesome Cry and his dam is Cousin VI. 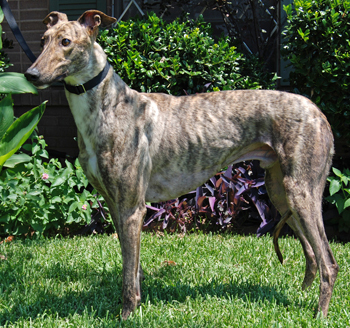 Lynn has two races to his credit in May 2011 on Greyhound-data.com, both at Gulf Greyhound Park in LaMarque, TX. Lynn arrived with an injured toe, which was not broken, but had an open wound which would not heal due to irritation from the neighboring toe. Dr. Ellis and Dr. Soileau of VCA Preston Park Animal Hospital determined that the best medical decision was to amputate the toe. The surgery went smoothly, and Lynn is healed. Lynn was in a home for a few months, but because of some separation anxiety, he's back on the hunt for his perfect forever home and would do best with a greyhound companion.